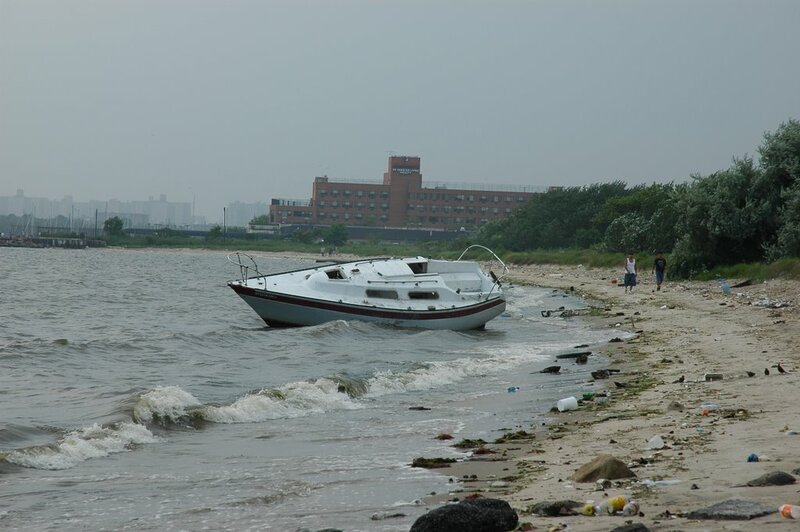 Sail Brooklyn: Free Sailboat in Brooklyn! Just off Plumb Beach in Brooklyn, there is a sailboat waiting for a new home. Best of all, its free. The catch is, the dismasted 20-something footer is aground and she looks to be in pretty bad shape. Maritime "law of finds" states that if find a wreck, you're welcome to salvage it. Who's boat is it? How did it get there? Why didn't the owner try to salvage it? How long has it been there? These questions and the story of the boat remain a mystery. Cant make out what boat it is, but looks like they've already 'salvaged' all standing and running rigging...Could it be it was moored at one of the nearby marinas and the mooring line parted/dragged? Won't the coasties remove it, though? I have no idea what the story is and if the Coast Guard would take it over. Can anyone tell me if it is still there? I would like to attempt to salvage it.